Densely erect bushy shrub. It has fine light green foliage. 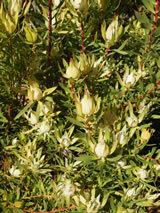 In spring wide bracts emerge a ivory-white colour and develop a pink blush with maturity. The stems are medium length and great for floral work. Very showy and lasts through the spring. To maintain bushy habit, prune back stems in late spring. 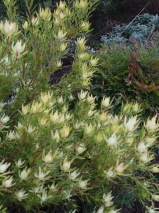 Best in a sunny site in well drained soil, tolerates dry conditions once established.